Colvinator and coochiee endorse this! Wow this squad looks really good. We can defiently go far this world cup, will be interesting to see if Singh and Cacace go. they will go and be signed elsewhere. Seems to be a few good fullback options? Might we see Libby at CB? Their coach has made it clear he won't be holding them back. Max Mata is suspended for the first two games right? Pretty good build up. Potentially each game getting harder with Mata back for 3rd match - should we still need a point or a win. I have really enjoyed the development of Stafford Dowling and Seth Clarke this year. I would say they are more midfielders, or, have more impact in the midfield than as forwards. "1966 was a great year for English Football, Cantona was born". picking a starting 11 will be hard, particularly further up the field. Will be interesting if Stensess and Zwellott play as CBs to make space otherwise? Who do you drop out of Singh, Bell, Just, Van der Hoven, Zwellott, Stensess, for the midfield? Who do we consider absolute lock-in's if all fit and available? Really excited by this squad and to see what Bucky can get out of them. Out with a broken foot atm, so might not be a dead cert? Very hard to choose, and lots of unfamiliar names. Why would you have Dingham as a sub and not directly at RWB? Allowed 10 on the bench. Wasn’t Zwetsloot a star of the U19 qualifying in the Islands. Werder Bremen must see something. He’d have to be in match day squad as a minimum. Looked at Tahiti stats too, played 24 min, 90 min, 55 min, 40 min, 72 min. Not full contribution either. Zwetsloot looked a notch above most players at the tournament - seemed to really add to our midfield. Has been in the reserve squad to at Wederbremen, but don't know if he got off bench. When Mata comes back in after his suspension I would pick Just to fall back into the middle alongside Bell and for Zwetsloot to slot into a back 3. A solid team with some good players on the sidelines. 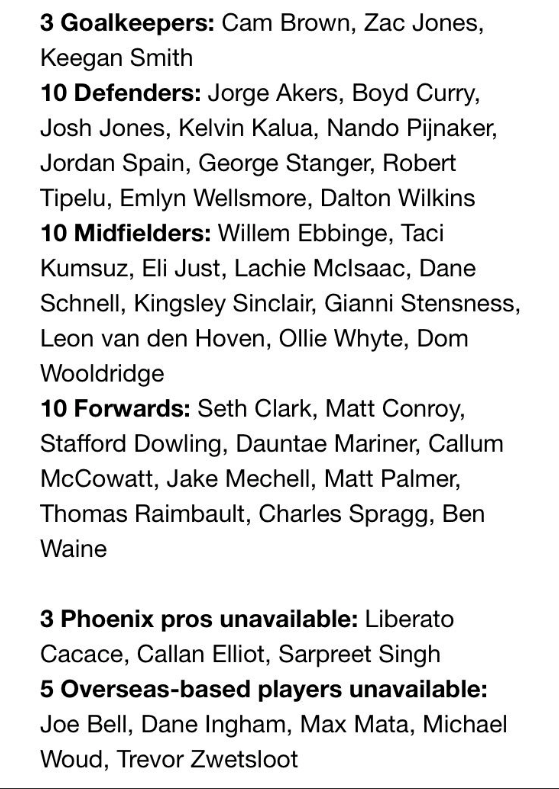 J Jones, Stanger, Wellsmore, McIsaac,Clark, Mariner, Mechell, Palmer and Raimbault - I've never seen play but it wouldn't be a surprise at all if one or more is so talented as to demand a starting spot. But putting them aside for now, my last 5 are Kalua, Curry, Wooldridge, Waine, and Zweetsloot. The 21 they actually pick will be way different.